See London’s highlights by retro double-decker bus, cruise boat and foot on this 5.5-hour tour. Take a seat on a vintage, red Routemaster bus and pass top London sights including Trafalgar Square, Big Ben and Westminster Abbey. Then, soak in more London landmarks, such as Tower Bridge and the Tower of London, on a Thames River sightseeing cruise. Finally, crown your tour with a visit to magnificent Buckingham Palace. Take an audio tour of the ornate State Rooms, only accessible to the public for two months in the year. Pair city sightseeing with guaranteed entry to Buckingham Palace’s State Rooms, open just two months per year. Travel independently to the start point in central London. 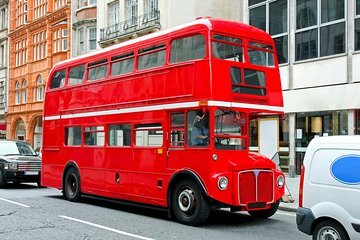 Meet your expert guide and hop inside your iconic Routemaster bus — one of the vintage, red double-decker buses that are forever associated with England’s capital. Sit back into your comfortable seat, and have your camera ready for your panoramic tour of top London sights. Journey around the landmark-packed heart of the city, and enjoy great views of such famous monuments as Lord Nelson’s Column in Trafalgar Square, Big Ben, and Westminster Abbey, the latter the setting of the wedding of Prince William and Kate Middleton in 2011. Leave your bus at the Thames River, and step on to a comfortable sightseeing boat for a scenic cruise. As you sail, admire London’s skyline. See the massive dome of St Paul’s Cathedral, and snap photos of Tower Bridge, the Tower of London and newer city icons such as the London Eye. Afterward, continue by bus to Buckingham Palace: the official London residence of Britain’s royals since the 19th century. Walk with your guide to the entrance of the palace, a site that’s only open to the public for two months each year. Then, bid your guide goodbye and enter independently as guides are not permitted to accompany you inside. Show your prebooked ticket, and set off on an audio-guided tour of Queen Elizabeth II’s opulent State Rooms. Admire the glittering chandeliers, sumptuous furnishings and other priceless treasures from the famous Royal Collection, and drink in the rarified atmosphere of the history-stepped rooms and halls. Your experience ends when you exit Buckingham Palace, leaving you free to continue exploring London independently or to make your own way back to your hotel. Totally enjoyed our bus tour on Sunday morning. We were able to see so much of London, in a short period of time. The driver was super spectacular, especially when you consider he had to avoid the bike London. We made it on time to the changing of the guards. Most tour groups missed it ,being stuck in traffic. Our guide had the perfect combination of knowledge and humor. We totally enjoyed!!!! My husband and I had just 2 full days in London so this excursion was perfect for us. Nick our tour guide made the tour even greater with his theatrical input in describing the history of London and its attractions. We only touched the surface on The Tower if London. Very interesting. We will come back and do it on it own. We feel like we got to know London with Nick’s insite and in deapt knowledge about the city and its attractions. The Changing of the Guards and Buckingham Palace was better than I had expected. It is a very Real exoerience being in the staterooms the Queen uses for visits by head of state and other important events like giving out medals of honors, Garden Parties etc. Well organised tour, perfect way to see the sights from the top of a double decker bus! It was great to hop on and off the bus to see the sights. The tour guide told various stories on and off the bus and on the river cruise on the Thames: a fascinating way to see London - Westminster, bridges galore, buildings old and new. Fantastic. Buckingham Palace was a highlight - the architecture, the paintings, the ceilings, the carpets, the opportunity to walk through the royal rooms, seeing gifts presented to The Queen during her reign. Highly recommend this tour. Bus experience was awesome. Kevin drove that big bus like it was a mini-car and Mark ? our Scottish guide provided everything we wanted/needed to know about London ! Excellent tour! Covered lots of sites. Our guide was very knowledgeable! The only thing I didn't like was being rushed into Buckingham Palace at the end of the tour. It was a half day tour and it would have been nice to have just received the passes and then gone in after some lunch! REALLY LOVED THE VINTAGE BUS TOUR,BUCKINGHAM PALACE WAS AMAZING,BUT WAS A BIT DISAPOINTED WHEN DROPPED OFF AT PALACE.THE LADY JUST LEFT US AND NOT EXPLAINED HOW TO GET IN.NO INFO NOTHING WHAT SO EVER. We had a fantastic tour. Excellent tour of the sights of London with a brilliant tour guide. Getting to see the Changing of the Guard was fun and carried out with military procession enabling us to witness three different aspects of it. Couldn't quite believe how lovely the boat was for the river cruise - after which we were transferred to Buckingham Palace and ushered straight to the entrance effortlessly - we then enjoyed a visit to the State Rooms. Really enjoyed the whole tour experience and excellent value for money. Special thanks to our guide. This tour didn't start too but as the day went along things improved significantly, our guide was pretty good giving us interesting tidbits along the way. The cruise was wonderful and Buckingham Palace was amazing. Excellent tour and real WFM. We had an Irish tour guide don't remember his name but he was fantastic! Very knowledgable and witty! Would recommend it!